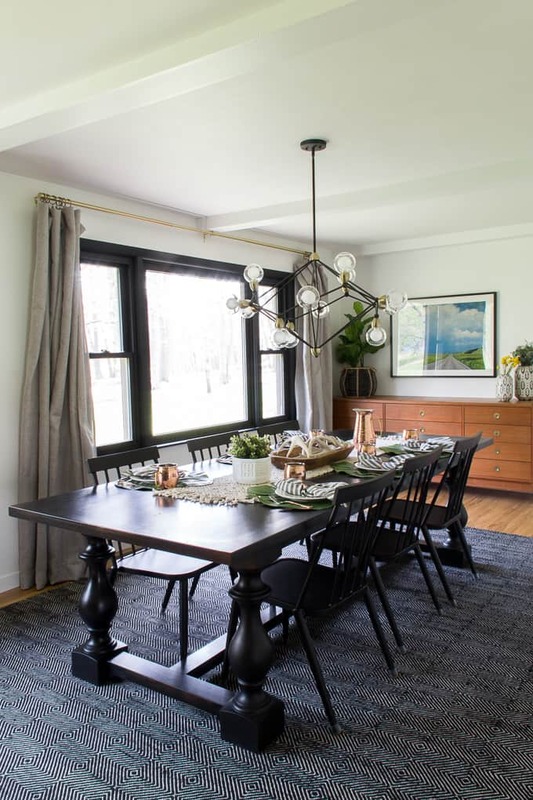 After a long hard two months or work, it’s time for our modern dining room reveal! 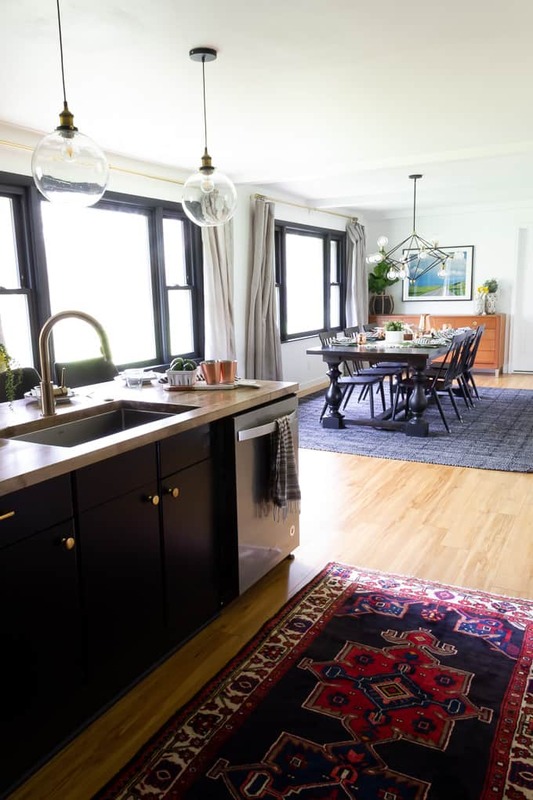 This dining room has come a LONG ways from the sad sunken den that it used to be. 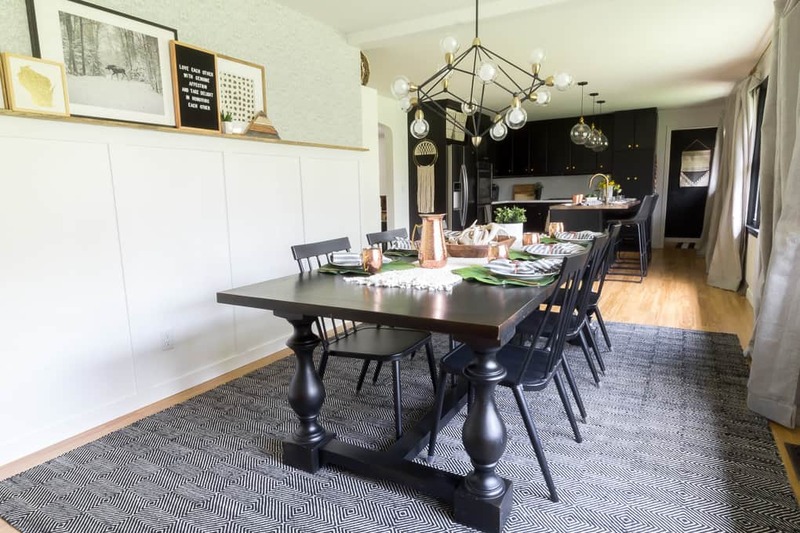 We were able to create a beautiful LARGE dining room that will likely be one of the most used spaces in our home. Just for context, here is what we started with! 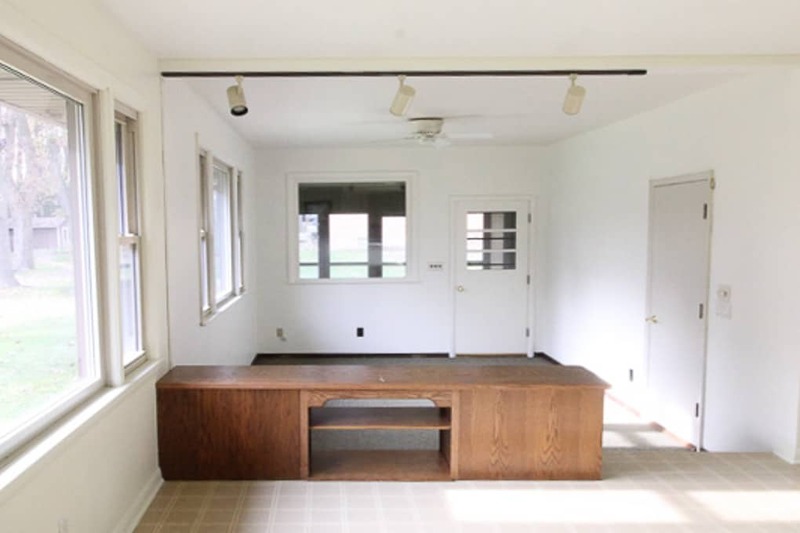 We had two doors to the garage, tan windows, a step down into a room with industrial carpet, a window into our sun room, a ceiling fan, and a poorly positioned built in bench. 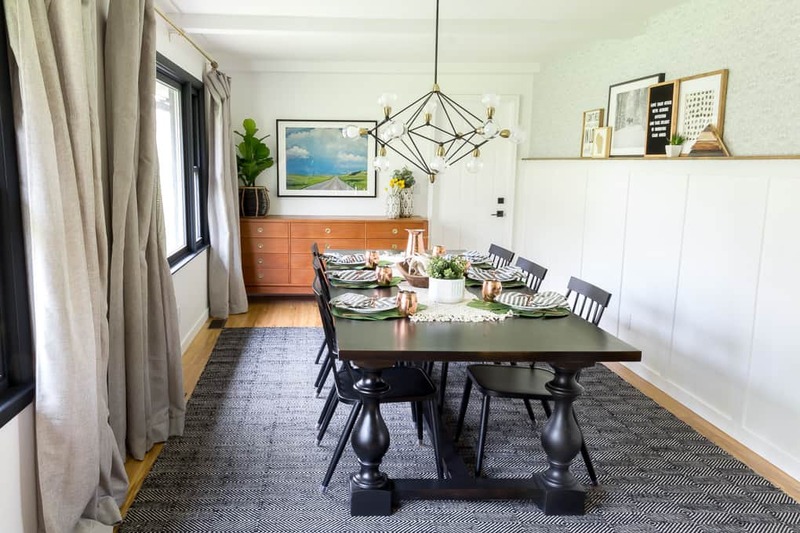 The first step to create this dining room was to raise up the sunken den to join the two rooms together as one. This included closing off the extra door and window, raising up the electrical, and moving the HVAC. Then I used special vinyl paint to paint all of the windows in both rooms black. Because the ceiling heights were different between the two rooms, I used faux beams to bridge the height gap. I moved the light junction box and installed this gorgeous modern geometric light. In order to soften everything I added simple grey curtains with brass rods. I found this amazing large table at the Restoration Hardware outlet for a steal of a deal at only $600… originally $2995! I stole the rug from our living room and used the black metal chairs that I’ve had for a while. For entertaining we could easily seat ten, or even twelve people at the table! 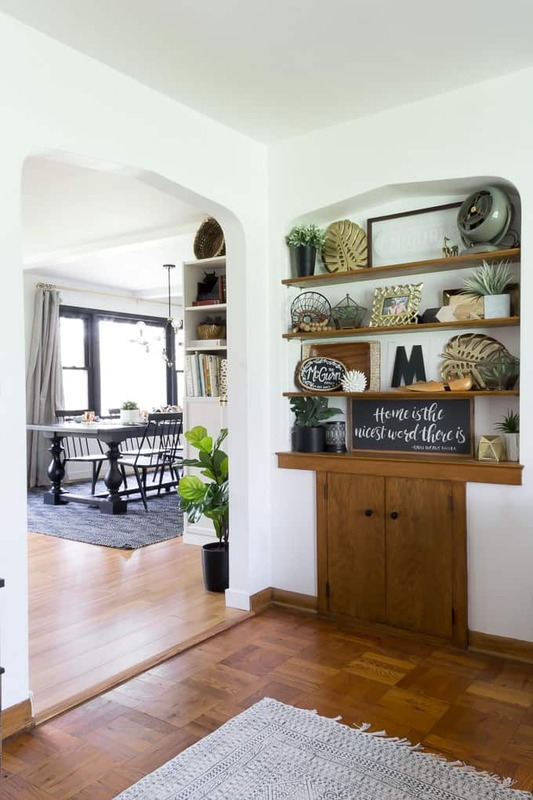 To help break up the long blank wall on the other side of the dining room I used trim to build faux board and batten with a stained photo ledge. Above the photo ledge I made a last minute decision to install subtle gray patterned wallpaper. I found this vintage Mid-Century dresser on a local Facebook page, and I just added brass legs to raise it up. For parties and large meals it will be great to use as a buffet, drink station, etc. Above it I hung this gorgeous landscape that brings the perfect pop of color to the room. Now that this space is complete our home flows SO much better. 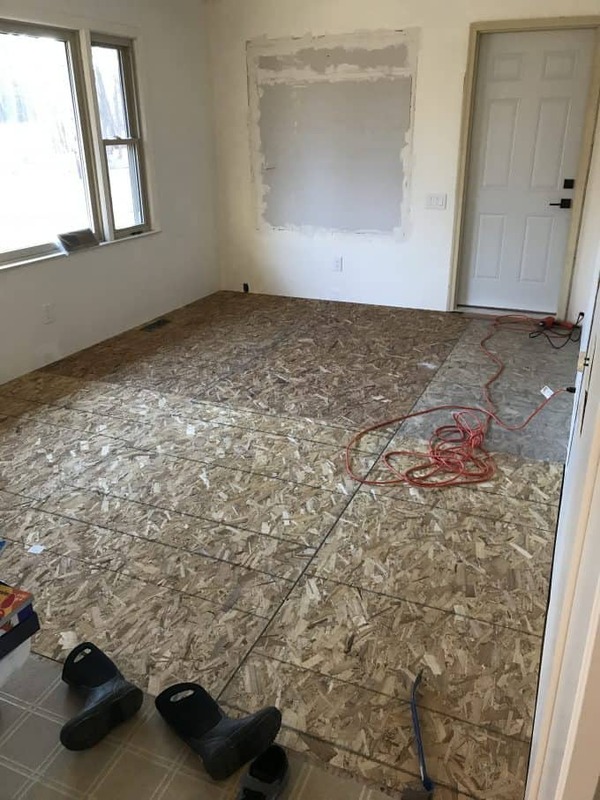 Eventually we’d love to turn the sunroom into a mudroom and this door will become a cased opening, but until then we just get to the garage through the sunroom. Thank you SO much for checking out our dining room! 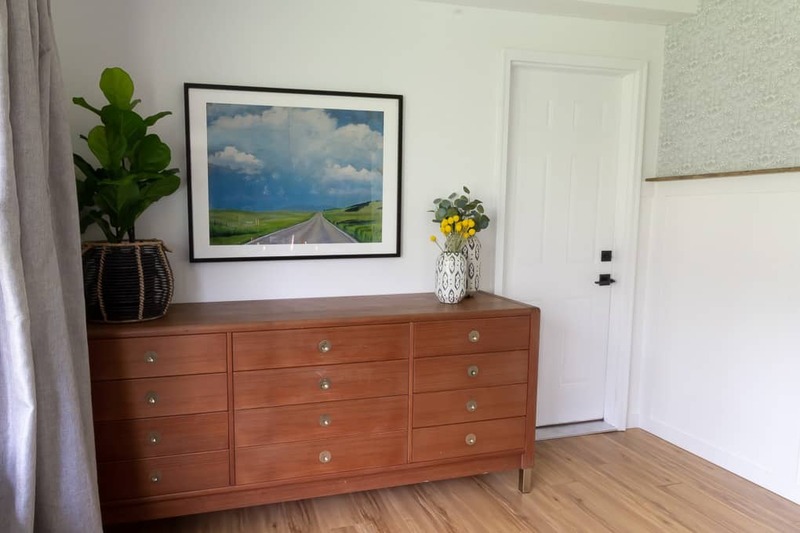 For the prior weeks posts check them out here: How we Raised up our Sunken Den, Mood Board and Plans, How we painted our Vinyl Windows Black, Faux Ceiling Beams, Our new laminate Floors, Kitchen with Black Cabinets. I’ve also included a roundup of shopable images, just click on any of the images below to shop (or double click on mobile). I hope this post has inspired you! 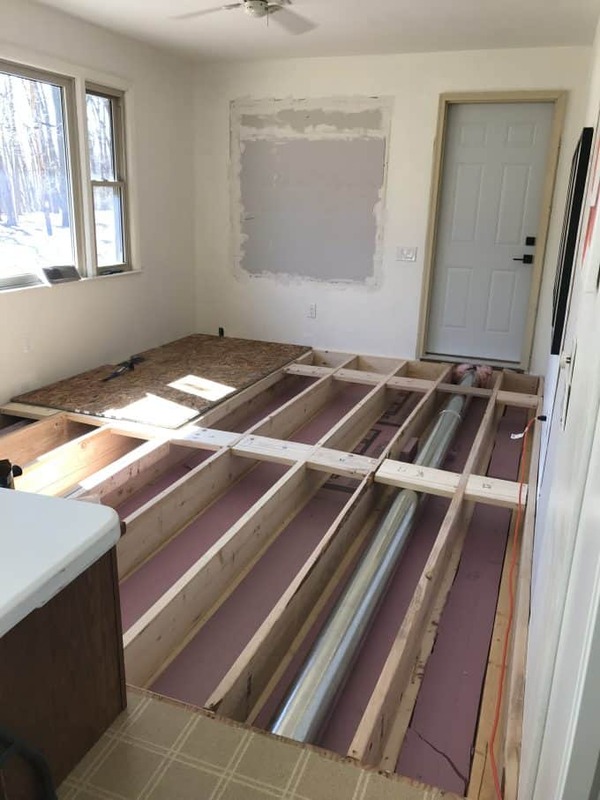 Maybe you have a sunken room you hate? 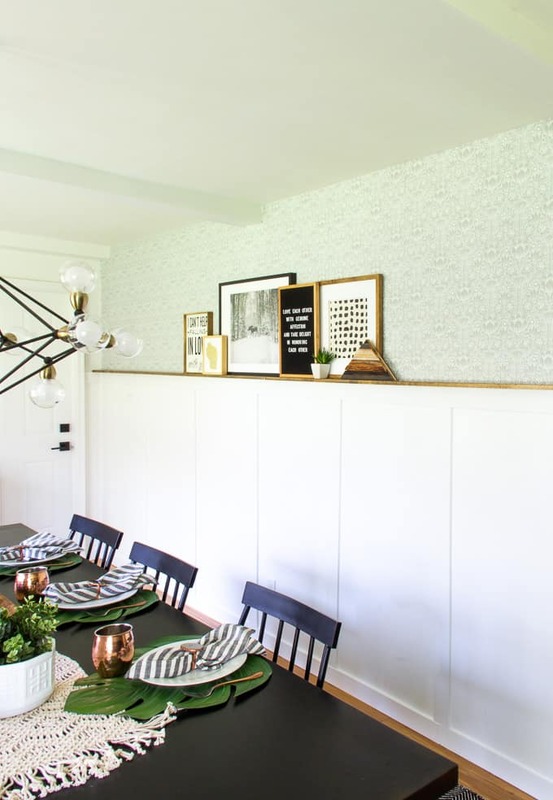 Or maybe you can be inspired to make a simple change like swapping out your hardware or updating a light fixture? Either way I hope I can inspire you to create a home that you love.